Hardscape design and masonry define the spaces of your outdoor environment. Coconut Contracting is licensed by the Registrar of Contractors to design and build any type of masonry structure to enhance your backyard. That means we can build your dream outdoor kitchen and fireplace. 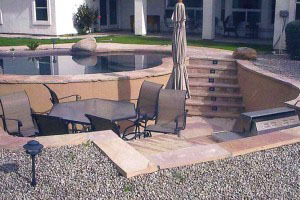 We can design and build raised masonry planters to create a tiered affect to an otherwise flat yard. Your hardscape or masonry features define your yard and create more functional, usable spaces.